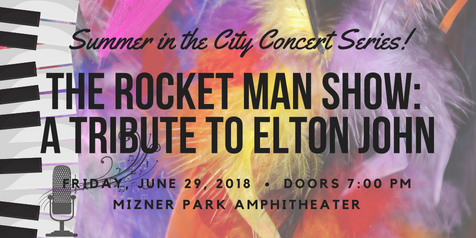 On Friday, June 29, 2018, the City of Boca Raton will continue its “Summer in the City” tribute concert series at Mizner Park Amphitheater with a live musical production of "The Rocket Man Show: A Tribute to Elton John." The event is free and open to the public with doors opening at 7:00 pm and the show starting at 8:00 pm. The concert will kick off with a live musical performance by soul & blues artist Bonefish Johnny, a local favorite, followed by an electrifying performance by renowned Elton John tribute artist, Rus Anderson, performing his own production “The Rocket Man Show.” Undeniably the most authentic Elton John tribute show in the world, “The Rocket Man Show” is regularly featured across the USA at well-known venues including House of Blues, Hard Rock Live, Caesar’s Palace, Legends In Concert, Universal Studios, & MORE!!! You do not want to miss this spectacular on-stage reproduction of the iconic music and persona of the young Elton John that will leave you speechless and promises not to disappoint! Mizner Park Amphitheater is located at 590 Plaza Real in Downtown Boca Raton, FL. Food and beverages will be available for purchase inside the venue, as well as plenty of family-friendly fun and games. All event attendees are encouraged to walk, bike, or rideshare to the event or use the free, yet limited parking available at City Hall and the Boca Raton Library. Blankets and chairs for seating are welcome, however, chairs will also be available to rent for $5.00 at the event which will take place rain or shine. 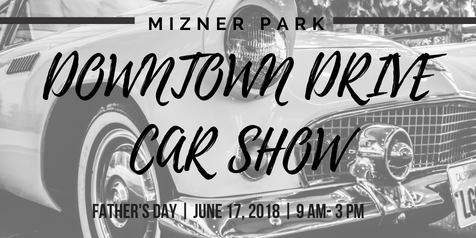 The Mizner Park Downtown Drive Car Show will take place this Father’s Day, Sunday, June 17, 2018! This exciting free event will be held from 9 am to 3 pm at Mizner Park, located at 327 Plaza Real in downtown Boca Raton, FL. This special Father's Day event will showcase over 100 automobiles which will proudly line the streets of Mizner Park. Featuring a diverse selection of unique cars including antiques, classics, street rods, race cars, sports cars, and a variety of other one-of-a-kind vehicles from the early 1900’s to the present, the show is sure to excite and impress even the most discerning of car aficionados. The Downtown Drive Car Show at Mizner Park is a charity event, with all proceeds raised through car show entry fees and charitable donations going to the Make-A-Wish Foundation of Southern Florida. The Make-A-Wish Foundation is an incredible non-profit organization which grants the wishes of children with critical, life-threatening medical conditions in hopes of instilling a sense of joy, hope, and strength in the children and families whose lives they touch. From young children who still have years to go before hopping into the driver's seat to life-long automobile enthusiasts, the Mizner Park Downtown Drive Car Show is sure to be a great time for all. Not only does the event benefit a noble and truly life-changing cause, but it is also the perfect, family-friendly way to spend this Father’s Day in downtown Boca Raton! We look forward to seeing you there!